England's James Anderson celebrates taking the wicket of the West Indies' stand-in captain Kraigg Brathwaite (Picture: Ricardo Mazalan/AP). THE CLIMAX of this series called to mind the climax of the Fawlty Towers episode The Germans. England's captain Joe Root in conversation with West Indies' counterpart Jason Holder at the conclusion of the three-Test series (Picture: Ricardo Mazalan/AP). 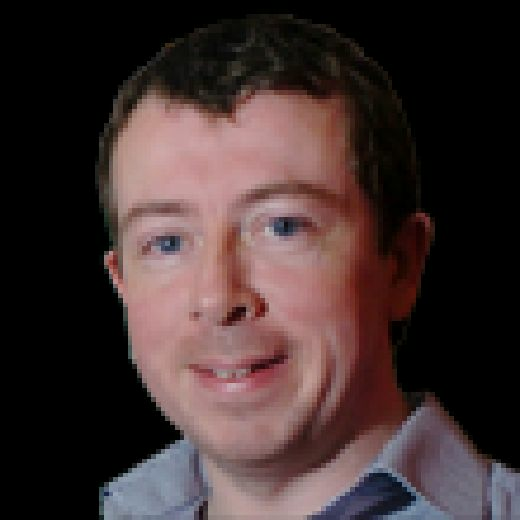 Similar thoughts might have crossed the minds of England’s supporters in St Lucia where the tourists’ thumping consolation victory was in stark contrast to the outcome of the sporting ‘war’ emphatically won by the West Indies. The hosts held an unassailable 2-0 lead going into the third and final Test, but they were no match this time for Major Root and his men, England winning by 232 runs with 12 overs of day four remaining. Although it was not enough to prevent them from falling like a moose’s head off a hotel wall and down to fifth place in the International Cricket Council rankings it at least averted an embarrassing whitewash ahead of the World Cup and Ashes later this year. There were, of course, mitigating factors in this game for the West Indies: their captain Jason Holder was suspended following the slow over-rate in Antigua; Keemo Paul, the all-rounder, tore a thigh muscle and was unable to bowl after the third morning, while their intensity had perhaps dropped with the series already done and dusted. But it was a result that reflected England’s fighting spirit, even if they did produce too little, too late. “It’s been a tough tour,” captain Joe Root admitted. “West Indies have played some fantastic cricket and deserved to win the series. It was not so much a case in St Lucia, of course, of “Don’t mention the war” as “Don’t mention the word ‘gay’”, at least not in an insulting sense, as Shannon Gabriel, the West Indies’ fast bowler, is alleged to have done. Root, with whom he had a verbal contretemps on the third evening, drew widespread praise for his response – picked up on the stump microphone – that “there’s nothing wrong with being gay”. While Root was being applauded by everyone from Stonewall, the LGBT equality charity, to Steven Davies, the Somerset wicketkeeper and the first professional cricketer to reveal his homosexuality, the ICC last night announced that they have charged Gabriel with a breach of their code of conduct relating to personal abuse. Fittingly, if perhaps perversely under the circumstances, the only wicket to fall when England resumed on 325-4 yesterday morning, already a towering lead of 448, was that of Root when he clipped to midwicket a full toss from Gabriel. It barely mattered, though, as Root had 122 at the time and England had moved to 361-5, Root immediately declaring after a stand with Ben Stokes (48 not out) worth 107 inside 25 overs. The West Indies, already beaten in everything but name, were left needing 485 to win or to somehow bat out the last 175 overs of the contest, a forlorn hope. Within seven overs of their ‘run-chase’ they were 10-3, all the wickets to James Anderson, who bowled superbly from a slightly elongated run-up designed to prevent him from running on the pitch. John Campbell was spectacularly caught in the gully by Moeen Ali, Kraigg Brathwaite taken at second slip by Stokes, and Darren Bravo pouched at first slip by Root. Stuart Broad would have got in on the act, too, had Jos Buttler not dropped Shai Hope at third slip on nought, Buttler’s catching in this series having gone curiously awry. Not so that of Broad, who took a beauty in the first innings and followed up with a more regulation grab at cover to dismiss Hope eventually off a leading edge off Mark Wood, the hosts falling to 31-4. Wood was not quite as devastatingly fast as he was in the first innings, when he hit 95mph, although one ball yesterday was clocked at 93mph amid offerings mostly around the high 80s. There was some resistance from the West Indies in the afternoon, Roston Chase, who top-scored with 102 not out, and Shimron Hetmyer adding 45 in 16 overs before Hetmyer was run out. 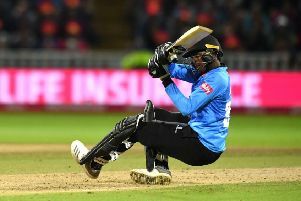 Chase played a ball from Wood to deep point and, as the batsmen attempted a third run, Joe Denly’s throw was superbly gathered on the half volley by wicketkeeper Jonny Bairstow who, in the same flowing movement, whipped off the bails with Hetmyer stranded. Moeen made it 110-6 when Shane Dowrich was smartly caught at slip by Stokes and, after Moeen had Kemar Roach badly dropped at mid-off by Rory Burns, he did send him back courtesy of a swat to Wood at cover. Moeen claimed his third wicket when Alzarri Joseph skied high and straight to Anderson before Stokes had Gabriel caught behind. Paul emerged to help Chase, then 98, reach three figures before splicing back a return catch to Stokes that sealed England’s triumph.